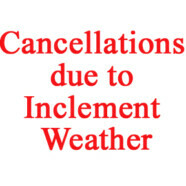 Religious Education class has been cancelled this Wednesday, Sept. 12th due to the impending hurricane. The CPR Certification class scheduled for Thursday has been postponed to next Wednesday, the 19th at 11 am. The Emergency Food Pantry will not be open this weekend. Please call the office for information about any other meetings scheduled for this week (843) 768-0357.